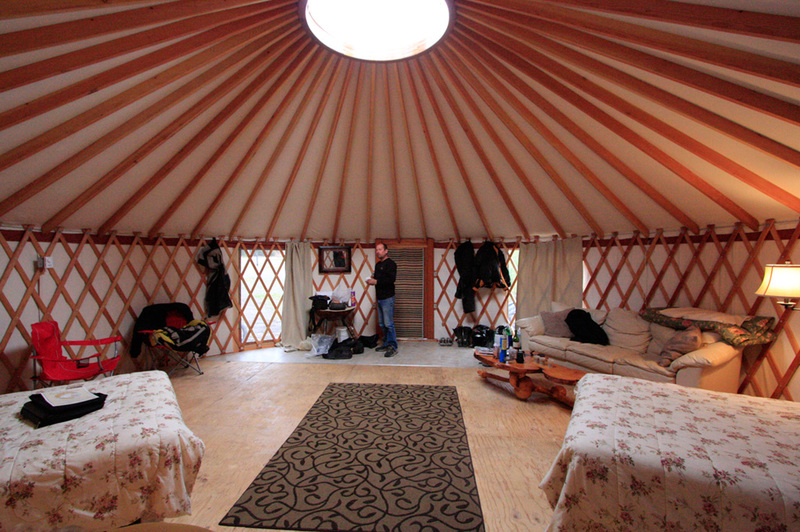 Can you really go wrong with a morning that starts in a yurt? Especially if the evening before was 100% boiled goat testicle free and featured a nice red wine rather than fermented yak milk? The yurt at Carlos Creek Campground in Denali is a long ways from roughing it in Mongolia and is more Ikea does yurt than animal skins stretched over a pole frame, but one can’t be too picky. It still ticks “sleep in yurt” off the to do list. Then there was the company. At a pizza shop across the highway, that mysteriously managed a small college town vibe in the middle of a national park, we meet Stephan. 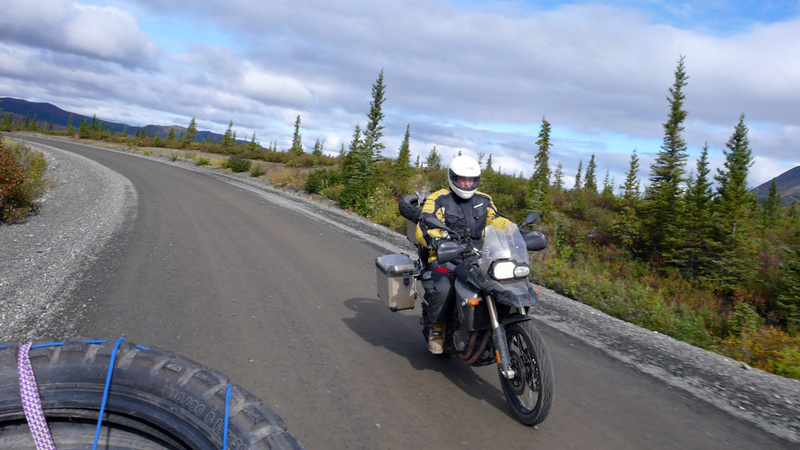 A Canadian ex-pat from Quebec, relocated to Panama, who is riding from Florida, through the North and then to Argentina on an R1200GS Adventure. Inevitably an invite to our Yurt-taculous abode is issued and a bit of red wine is offered up. Stephan has a very relaxed take on adventure. 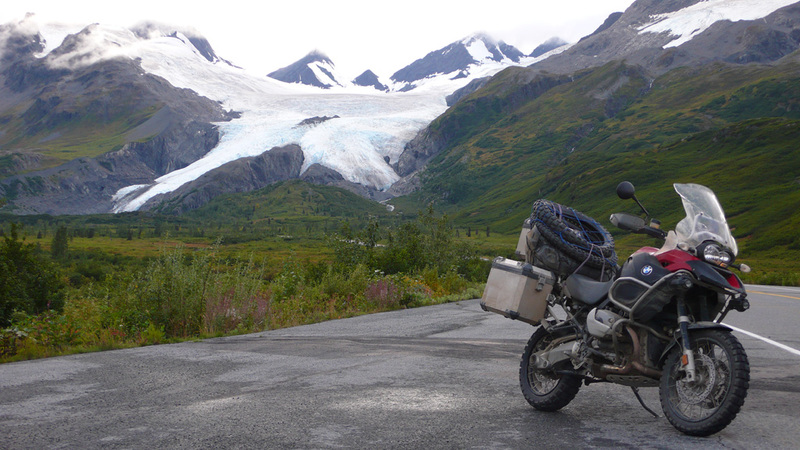 His big BMW is shod in street tires, and he makes no pretenses about taking it off road, “It’s almost all paved.” Nor is he overly taken with other GSA riders in Panama, “You see a lot of them in front of coffee shops, but they never go anywhere else.” Stephan undoubtedly is going somewhere else, traveling solo on only the vaguest of routes. 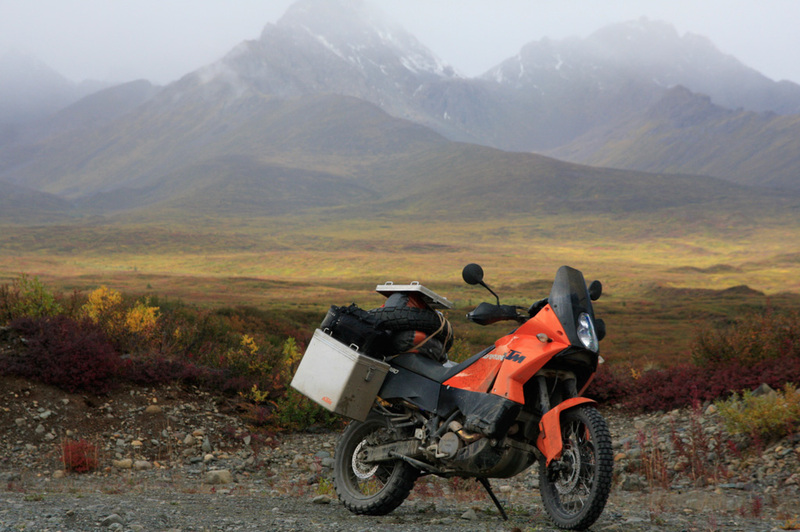 At the end of the evening we come away with an invite to Panama and advice on how to ship bikes around the Darien Gap, an impassable 10,000-square-mile roadless wilderness separating North and South America. That’s one possible future. The present sees us in Alyeska — the Aleut word means Great Land and the progenitor of Alaska. In the time we have, this place is a sprawling and unknowable poetry of immensities. Alaska’s heart is heaved three miles high by the pressure of the Pacific tectonic plate, it hosts Mount McKinley, the continent’s tallest peak, a 6,194 meter (20,320 feet) leviathan that looms over the state and can be glimpsed in the clearing morning. Its shores are shot-through with islands and studded with volcanoes. We can’t know this 147,710,259 hectare (365-million-acre) state except by a thin pavement and dirt line we follow. 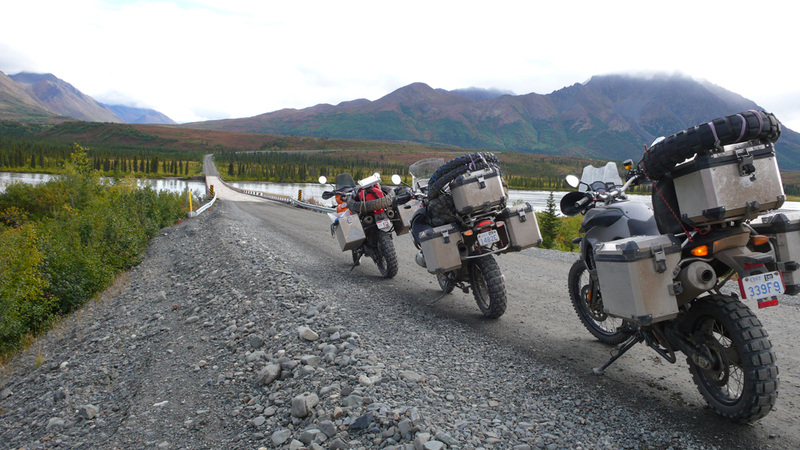 Our path is the primarily gravel Denali Highway, known less grandly as Alaska Route 8. 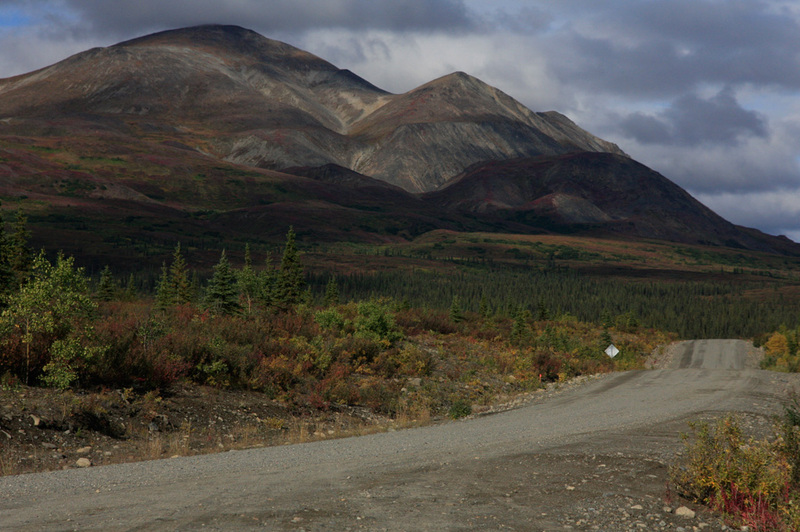 The highway’s construction was finished in 1957 providing access to Denali National Park, and then it was all but abandoned by the Alaskans and tourists when, in 1972, the paved George Parks Highway opened, linking Anchorage and Fairbanks directly with the park. Almost no traffic you say? 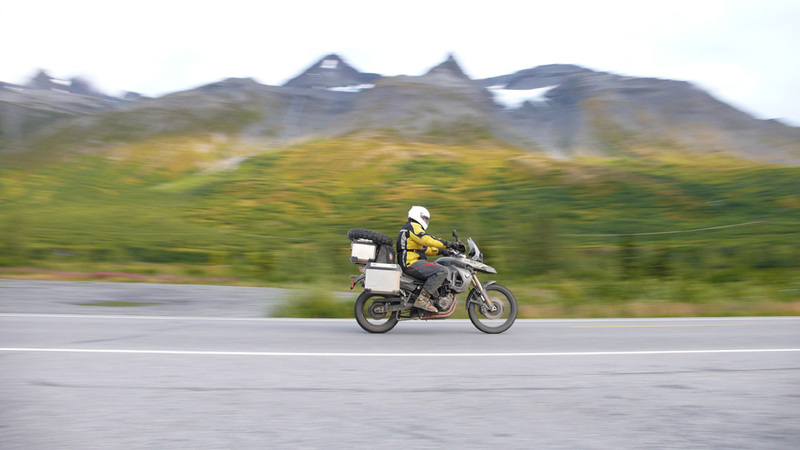 These can not be bad things, because while the George Parks Highway is a smooth and fast asphalt surface it’s filled with the Greater Alaskan Tailgater, a creature who refuses to acknowledge the spacious environment around it and, near sighted, only focuses on the rear plate of the vehicle ahead. Or perhaps the sluice slick cruise ship commercialism of the park entrance as the George Parks Highway enters the Park just south of Healy. 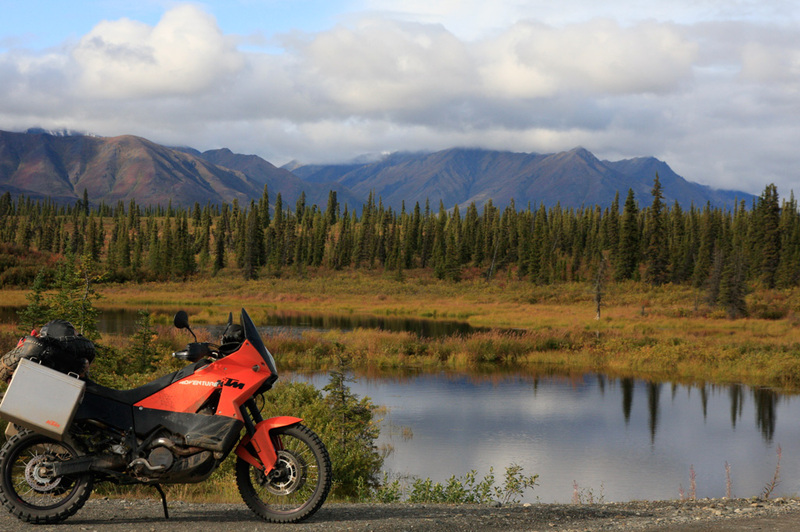 The park doesn’t allow personal vehicles beyond the Savage River Check Station at Mile 15 of the road into Denali during the summer, creating an opportunity for whole herds of Tailgaters to be corralled onto mass transit for a consistent, sanitized and commoditized wilderness experience. 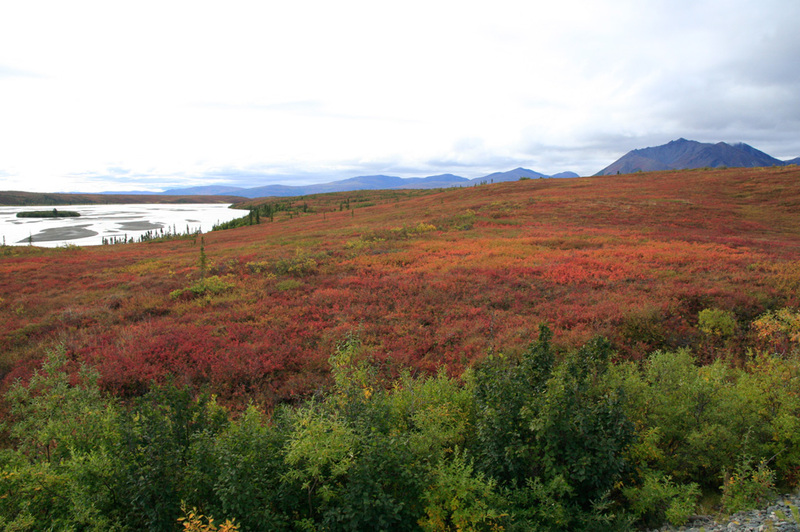 There’s a sense of loss in not seeing the true Denali, mixed with the pure joy of escaping Tailgaters’ linear migration route for a less traveled road, and the Denali Highway certainly is that. Open from mid-May though September, or until it’s closed by snow, today we share this road with a smattering of motor homes, a couple of tour buses, and a few passenger vehicles. All of which, like ourselves, stop for photos with metronome frequency. 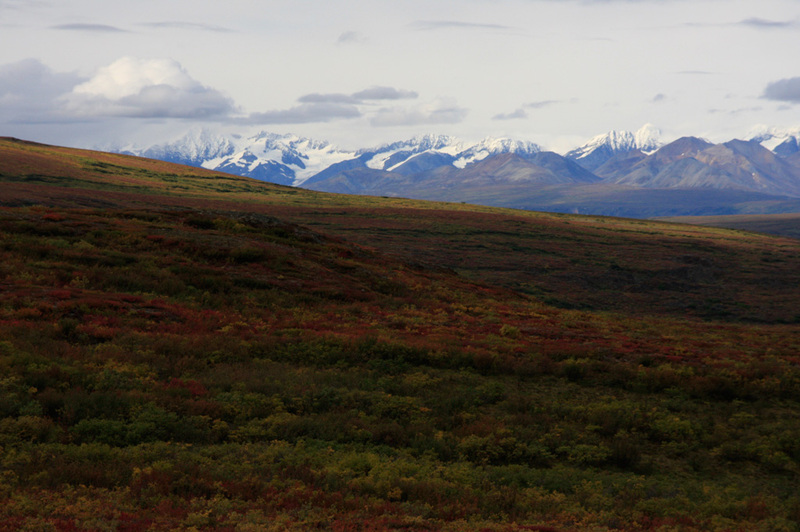 The Denali does not match The Top of the World Highway, nor is it on the Dempster’s coat tails, but you can’t help but fall in love with the 360-degree vistas of mountain and sky, their interplay with dark looming clouds, and the vast clean openness of the place. From Cantwell we follow the Nenana River upstream, the road meandering laconically through glaciers’ outwash plains, skirting the foot of the Denali Clearwater Mountains, wandering with easy curves through the Maclaren River Valley before climbing to the second highest highway pass in Alaska at Maclaren Summit (elev. 4,086 feet). 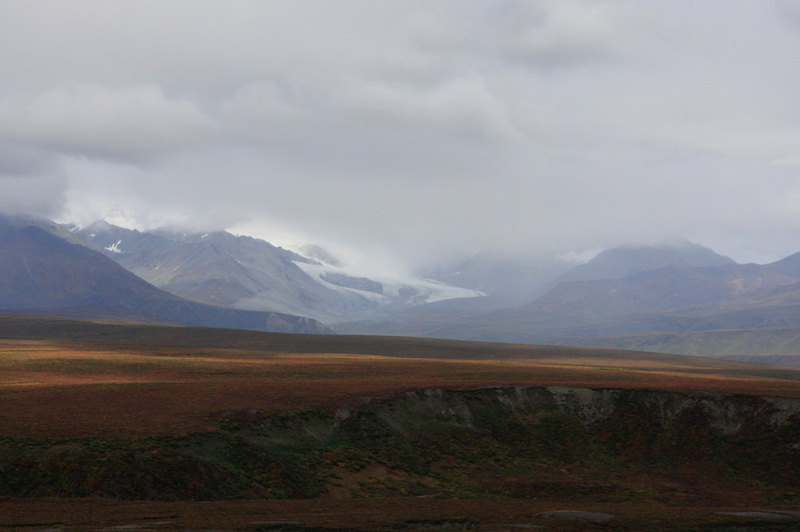 In the distance you catch glimpses of Maclaren Glacier and Alaska’s central range. The ride is relaxed and easy, a tame gravel road by comparison to most we’ve run thus far with only one complication, construction. There is a saying in the north, “There are two seasons; winter and construction.” We are in the latter, still the feel of this being the friendly north holds. Merrily beetling along on the BMW F800GS, a grater operator brings his machine to a halt, and hanging out of the cab flags me down. “Starting a couple miles down there’s a lot of loose dirt on and off, I just did that section, so be careful.” The warning is appreciated, but I’ve been feeling a groove in the loose stuff on the F800GS so while I’m still slowing to see what traction the surface holds I’m not overly worried by the turned up road. 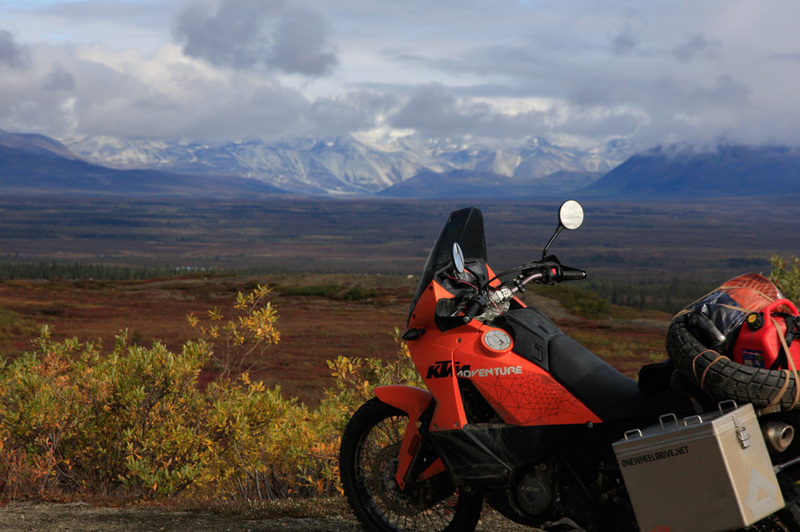 At about 150 kms from Cantwell we stop in at Maclaren River Lodge. The operator is enthusiastically engaging us in the “which adventure bike” conversation, when a loud double-bang shakes the 1950’s log building. As we mount up you can see the interplay of contrails in and out of the clouds, even as the lodge’s two resident dogs quake by their owner’s sides. As we wind through the Amphitheater Mountains, I’m wondering what affect the sonic booms have on the local wildlife. Do they become acclimatized? Do they startle and quake every time like the dogs? Somehow this “do as we please” military intrusion in Denali diminishes the place by destroying the illusion of it being untamed. Alaska is a huge, distant and unfurled landscape that recreates the motorcycle traveler as a speck of dust on a dirt thread and exposes you to the Alaskan Paradox; rush of roads, tour bus herds milling through designated photo checkpoints, a cruise ship industrial complex of made in China Alaskan memorabilia and state serrating pipelines, all surrounded by unbound natural beauty.